Give it up for the IDF The Israeli Defense Force! Even in the face of adversity the Israeli army manages to negotiate unimaginably complex situations, and shows restraint where many others would simply degrade to brute force. The recent flotilla affair has brought all of Israel's haters lining up to rebuke the IDF. It's time we show them that the IDF has many supporters in its favor too, and that we will not stand idly in the face of injustice! 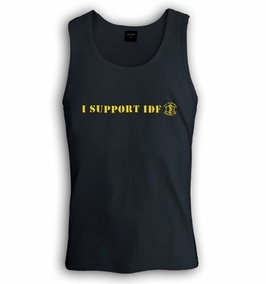 Wear this high quality "I Support IDF" T-shirt sporting the IDF symbol in expression of your support! Our t-shirts are made of 100% cotton and are long lasting with bright colors. Our products are all designed and printed in Israel.